A minor wakaonnagata actor was recorded in the Ôsaka hyôbanki, which was published in the 3rd lunar month of 1707. No record afterwards. A minor actor held the name of Nakamura Daikichi between 1758 and 1776 in Kamigata. He was never acknowledged as an official holder of the name. A minor iroko actor was recorded in the Kyôto hyôbanki, which was published in the 1st lunar month of 1784. No record afterwards. The actor Nakamura Daikichi I held this name from 1800 to the 3rd lunar month of 1823. Dates of birth and death unknown. This actor started his career in Kamigata, performing under the name of Yamashita Kamenojô V in miyaji shibai. 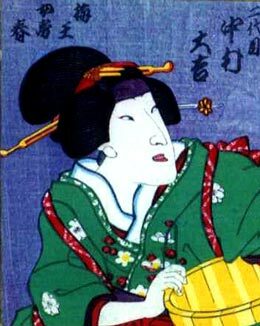 He took the name of Arashi Kamenojô II in 1815. 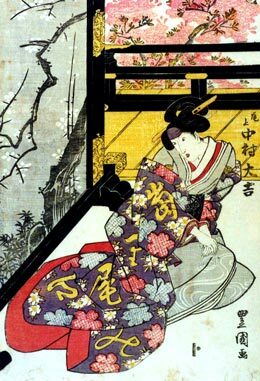 He went to Edo with Kataoka Nizaemon VII in the 1st lunar month of 1826 and was adopted there by the family of late Nakamura Daikichi I. He took the name of Nakamura Daikichi II in the 11th lunar month of 1826 at the Nakamuraza, performing in the drama "Kaeribana Genji no Kachidoki". 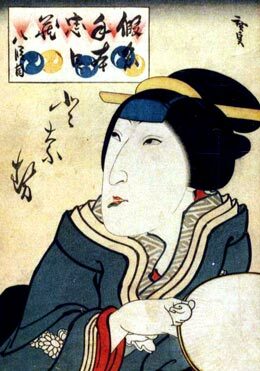 He took back the name of Arashi Kamenojô II in the 11th lunar month of 1828 at the Ichimuraza. His last recorded performance was in the 11th lunar month of 1838 at the Kawarasakiza. We don't know what happens to him afterwards for he disappeared from the records. He was an onnagata actor, specialized in musume or nyôbô roles. The actor Nakamura Daikichi III held this name from the 5th lunar month of 1840 to 1846, then from Spring 1848 to the 11th lunar month of 1857. The actor Nakamura Keijo held the name of Nakamura Daikichi IV from 1866 to 1869. A minor actor held the name of Nakamura Daikichi between 1887 and 1915. He was never acknowledged as an official holder of the name.